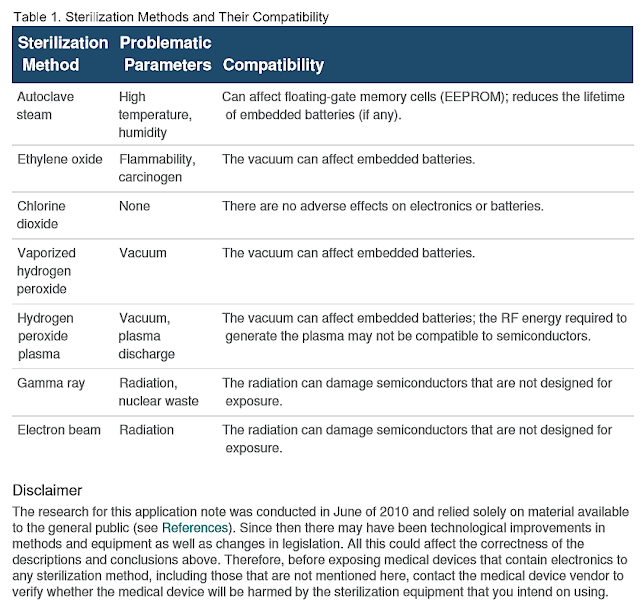 Although there is considerable literature about sterilization methods, there is little written about the impact of sterilization on electronics. Thanks to the advances in semiconductor and packaging technologies, integrated circuits (ICs) are found in a widening selection of equipment including medical devices. For these devices’ applications, they must remain free from harmful contaminants such as fungi, bacteria, viruses, and spores. Therefore, Maxim Integrated Products, Inc performed a study in June 2010 comparing the biocidal efficacy and material compatibility of steam, Ethylene (EtO), Gaseous Chlorine Dioxide (CD), Vapor Phase Hydrogen Peroxide (VPHP), Hydrogen Peroxide Plasma, Gamma radiation, and Electron Beam sterilization suitability for objects containing batteries or electronics. The complete application note can be read here, but Table 1 summarizes the methods discussed and their compatibility to embedded electronics. Chlorine dioxide has no known adverse effects on electronic components and is, therefore, the best overall choice for compatibility. 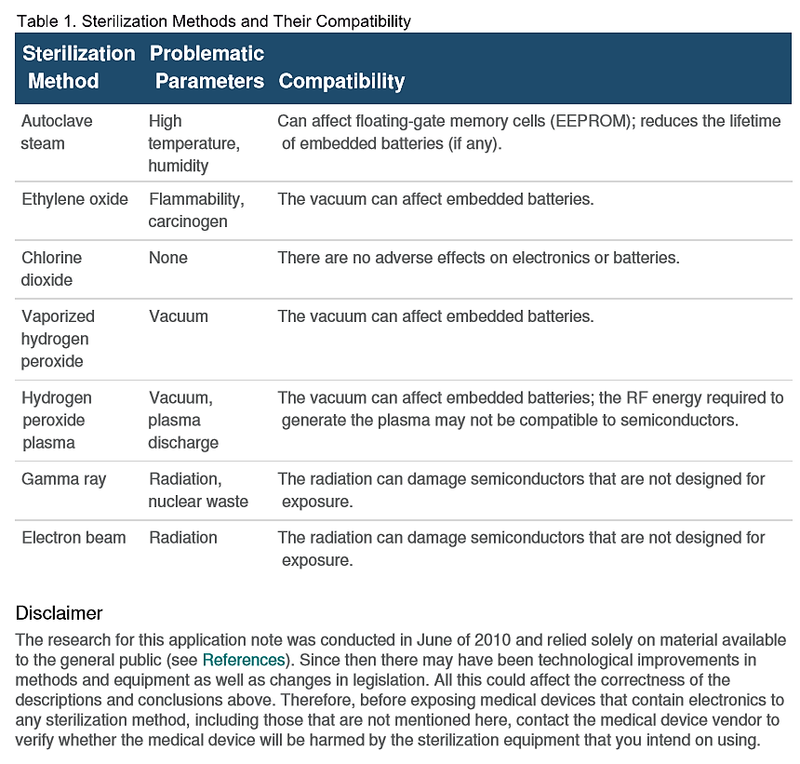 EtO and VPHP are noted as excellent choices for electronic medical devices that do not include batteries. Other methods might require electronics to be modified specifically for exposure. ClorDiSys had no involvement with any testing or research in the development of Maxim’s Application Note. 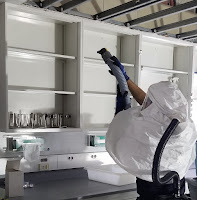 The dramatic resurgence of bed bugs in the United States poses significant problems for individuals, public health officials, and the pest control industry. Bed bugs are responsible for a variety of health concerns, causing the CDC to recently release a joint statement with the EPA declaring bed bugs a significant public health problem. Unfortunately, bed bugs are resilient and difficult to remove due to their cryptic behavior and general physiology. They are active nocturnally when hosts are sleeping and unaware, and their flattened bodies allow them to squeeze into cracks and crevices, making removal by physical or chemical control methods difficult. No individual control measure, chemical or otherwise, has proven to be one hundred percent effective in the removal of bed bugs from domestic structures. 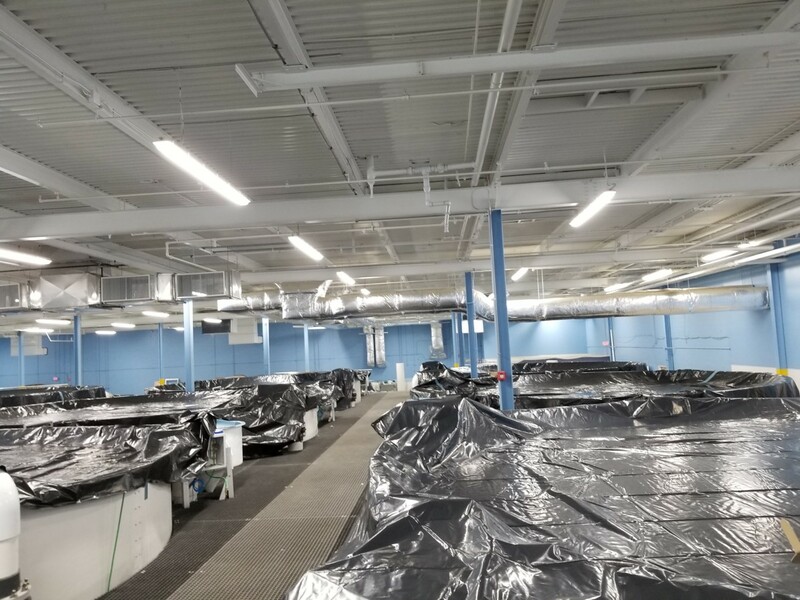 Eradicating bed bugs from a premise is extremely challenging. Over-reliance on pesticides, such as pyrethroids, has been linked to increased resistance in bed bug populations. Alternative methods of control are needed to aid in a broader removal strategy. Ultraviolet (UV) light is known to damage DNA by altering the nuclei of the cells due to photolytic processes; however, its various effects on arthropods have not been well documented. A 2013 Ohio State University study examined the impact of ultraviolet light on bed bug survival and behavior, and is a first step in determining the potential of UV as a control measure. The study exposed the two developmental stages of Cimex lectularius, the egg and the first nymphal instar, to ultraviolet light for periods of 1, 2, 5, or 10 seconds at a distance of 4 cm. A dose response curve was created by calculating mortality following an interval of 2 weeks. 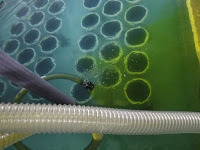 Behavioral observations were also conducted to assess the effects of UV exposure on the host seeking abilities of first instar nymphs. Egg stage mortality was significantly higher in groups exposed to 2, 5, or 10 sec of UV light, with almost no subjects surviving 5 and 10 sec exposures. Mortality in first instar nymphs was somewhat less dramatic, with only the 5 and 10 sec exposures showing significant effects. The 10 sec exposure was the only treatment to cause mortality higher than 50%. It was believed treatment was less effective because these eggs were further along in their development. Behavioral observations supported the hypotheses that host-seeking abilities would be adversely impacted by exposure to UV light. Both the 5 and 10 sec exposures significantly decreased the host-seeking success rate in first instar nymphs. This project strongly suggests that ultraviolet light is effective, both in killing bed bugs and impairing their ability to reach a host. 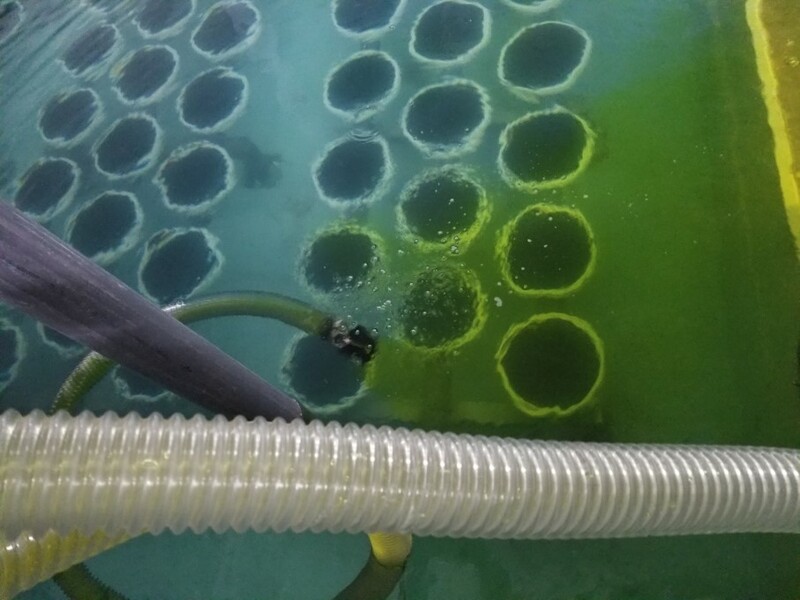 While eggs have proven to be most resistant to current control tactics, they are highly vulnerable to UV treatment. 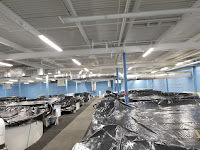 Particularly appealing is the fact that UV light provides a dry, chemical-free, and residue-free method of control that, with proper shielding, could be used by consumers without the aid of professionals. This study offers initial proof of concept that it is possible to kill bed bugs using only light. To read the Ohio State University study in its entirety, click here. If you are attending EMS Today February 20-22, stop by booth #1145 to see some of the ClorDiSys UV-C product line and discuss applications.